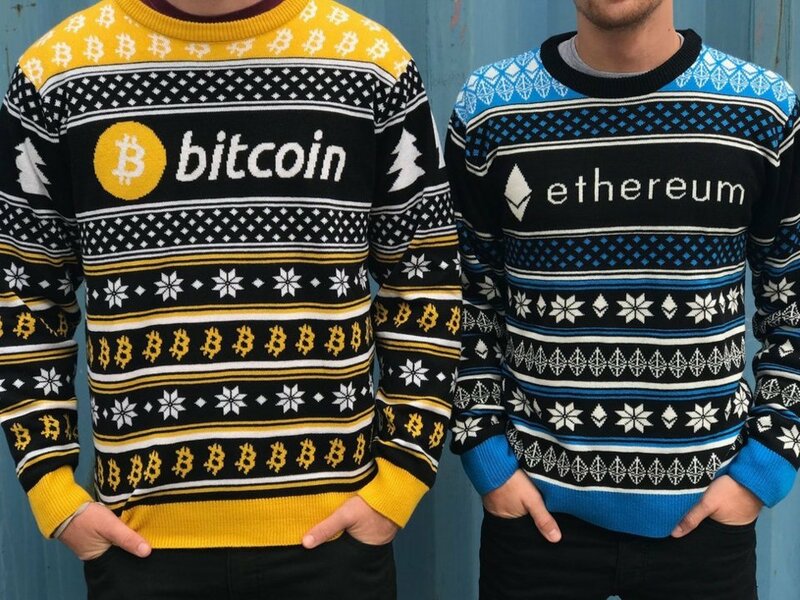 Hodlmoon is making ugly Christmas sweaters a year-round fashion statement with their own “ugly cryptocurrency sweaters”, and the company says business is booming. UglyChristmasSweater.com is one of a multitude of companies to venture into the cryptocurrency space lately, but not in the traditional sense. The sweater company’s spinoff firm, Hodlmoon, launched in October of last year and has been a hit among cryptocurrency enthusiasts. The fully-knit sweaters are adorned with the logos of popular cryptocurrencies such as bitcoin, Ethereum, and Litecoin and retail for $59 each. Hodlmoon has reportedly sold over 2,000 sweaters and raked in an astonishing $200,00 in sales in 2017 alone. Zac Cohen was working as a web developer for UglyChristmasSweater.com when the idea came to him. After investing $100 in bitcoin in 2013, Cohen watched as the price per coin soared and resulted in unbelievable returns. He explained his reasoning for the decision, comparing the cryptocurrency to gold. Similarly to the precious metal bitcoin has a limited and finite supply. With this knowledge, buyers expect the value of bitcoin to increase while the supply decreases. “I was just like, I’m going to buy one so I can say I have one of 21 million,” Cohen said. He watched the mainstream media focus on the soaring price of bitcoin last summer, ensuring that almost everyone had been exposed to the concept of cryptocurrencies. As BTC prices increased exponentially, it prompted a buying frenzy and drove the price even higher. Cohen saw an opportunity amidst the fervor, but not in any cryptocurrency itself. He approached the owners of UglyChristmasSweater.com, brothers Fred and Mark Hajjar, where he pitched bitcoin themed ugly sweaters. The brothers created a spinoff of their company and gave Cohen creative control, dubbing it Hodlmoon. “Hodl” is a term in the cryptocurrency community that means to hold onto holdings and resist selling, even if the price slides. Even months after the holiday season, people are sporting their Hodlmoon sweaters. Even Vitalkik’s Buterin father, Dmitry, shows off the Ethereum-themed sweater in support of his son. Cohen says the passion of the crypto community is what attributed to the success of the company. Hodlmoon accepts credit or cryptocurrency, of course, as payment and hopes to maintain their astounding revenue. Do you have a Hodlmoon sweater? Would you wear a sweater with your favorite cryptocurrency on it? Let us know what you think in the comments below! The post Hodl in the Codl: Business is Booming for Ugly Bitcoin Christmas Sweaters appeared first on Bitcoinist.com.